In the first installment of Steve Rodgers’ imaginative and impressive “Spellgiver” fantasy series, the course of the hero’s journey does not run smoothly. The protagonist faces a host of challenges, foes and dangers over the course of 250-plus pages. 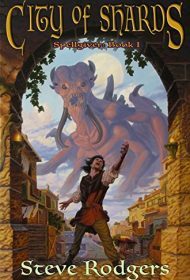 From a young age, Larin has been sequestered in a four-block temple district of Wormpile, a seedy, gang-infested area in the coastal metropolis of Aldive in the Empire of Tanbar. He’s been isolated with his drug-addled, warrior-priest uncle, Akul, due to his unusual type of power. Specifically, Larin is prone to screaming out nonsense words at random, a kind of “magical Tourette syndrome” that carries the potential to unleash Haraf, Lord of Demons, who’s been imprisoned by the equally menacing Six-Legged Gods. This conflict comes to a head when Larin is 16 and finds himself caught in an epic struggle between Haraf and the Six-Legged Gods, in which he must play an unwilling part. With allies that include his junkie uncle, an alcoholic priestess and snobby wizard, Larin must learn to harness his magical powers and choose his path carefully. Meanwhile, the Empire of Tanbar is threatened by vengeful forces fighting for evil gods. Larin’s hero’s journey features familiar fantasy elements: kings, monsters, magic and mysticism. Yet Rodgers manages to weave a stunningly refreshing take on traditional genre tropes. Plot developments are highly unpredictable, and the story is admirably nuanced, with Larin forced to choose between allegiances that each carry dark consequences. With a sharp, incisive narrative style, Rodgers delivers a colorful cast of fully developed characters and believably flawed heroes. The book also includes a comprehensive history of the fictional realm and carefully plotted maps. This degree of detail will delight committed fantasy fans, but may prove too dense for casual readers. Nevertheless, the author has created a fictional world that shines with a rare degree of immediacy and realism—even with its wizards, monsters and six-legged gods. Readers will savor the journey.